AHB Construction is owned and operated by Alexander Burr, who maintains that quality and professionalism are the keys to successful projects. Alexander has a long background in the construction field starting at a young age. Alexander’s career in construction began with his first construction job working as a laborer shortly after he began moving his way up through the trades. Alex specialized in framing and finish carpentry before making the decision to pursue a formal education in the field of construction. Alexander Holds a Master’s degree in Construction Management from Florida International University as well as an undergraduate degree in the same field from California State University, Chico. He states that his education has only furthered his success in the construction industry. In 2009 Alexander obtained his California Class B General Builders license. 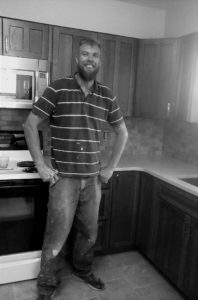 This was his first professional license and has since has been preforming residential projects and dabbled in commercial and government work as well. AHB Construction specializes in residential work, but also offer services for government and commercial projects. AHB Construction prides its self on the ability to full fill all contractual duties, maintaining schedule and staying on budget. You will love our professionalism, ability to communicate, and our overall presentation.